Yesterday I had a rough finish to my workday. I’d spent most of Monday, Tuesday, and Wednesday working very hard on an urgent marketing piece. By the end of yesterday I thought the marketing guy and I had it buttoned up. We’d gone through two rounds of edits by the final approver, and just sent it back for one last confirmation that our last tweaks met the need. The approver shredded (metaphorically; it was a digital file) the document, rewriting vast swathes, stomping like an elephant through the delicately crafted savannah of my work. I’d put in almost three days of work on this, and now the approver — who is not a writer and who knows next to nothing about good writing — took my work, tossed it out the window, and rewrote the entire thing in their own words. I’m not normally protective of my work. You’ve got to develop a thick skin when it comes to editorial revisions if you write professionally. You have to let even the loveliest turn of phrase go to the chopping block, if need be. While it’s painful, I think I do an okay job accepting even really deep editorial changes when it’s appropriate. But the approver didn’t offer editorial suggestions; they rewrote in whole cloth, changing sections that the approver hadn’t mentioned as having issues in previous reviews, axing perfectly fine sentences and paragraphs and replacing them with the same thing in the approver’s own words. The approver clearly thinks they are a better writer than the professional writers they have on staff. My work is crap. The approver, who’s a company executive, thinks they know more about writing than I do. I worked really hard to write something good, that I was proud of, and the product of that hard work — which I thought was actually pretty good — is worthless to the approver. The approver doesn’t trust me to do my job. They previously provided (in my opinion excessively) detailed, line-by-line feedback, which we incorporated. But that wasn’t good enough. The only person the approver trusts to write it is themselves. My three days of work don’t matter. I put aside an enormous, challenging, high-pressure tech writing project to work on this marketing article. That project remains unfinished, other deadlines are fast approaching, and this marketing article has turned into a zombie project that just won’t die. Also, presumably the approver has their own work to do — you know, doing whatever executives do. Making high-level decisions, maybe. I don’t know. I’ll never be an executive, thankfully. Don’t they have anything better to do than nitpick (honestly, “nitpick” implies a smallness to the scale that really isn’t accurate) a perfectly good piece? When I told my boss all this, he said, “Well, the approver isn’t good at people.” He wanted me to understand that this drawing and quartering of my document wasn’t personal; the approver wasn’t trying to send me a message. To which I say: If you’re in an executive position, it’s your job to be good at people. You cast a huge shadow, and you have to be aware of the impact to everyone it touches. I’m not giving them any grace here, because they are completely in the wrong. They are wrong to go in and do someone else’s job. They are wrong not to consider the impact of doing so. And they are wrong to make our company look worse by sending out low-quality marketing copy. The article was good; it was ready to go, and their “edits” made it substantially worse — and I know it won’t matter. They’ll get their way, my company will look like incompetent communicators when we send out this ugly, kludgy piece of trash, and I’ll still feel like a piece of poo on the bottom of the approver’s shoe. I’m starting to think that maybe marketing writing isn’t for me after all. *Note: I know I’ve misused “they” and “themselves” throughout. English doesn’t have a good neutral pronoun, and I didn’t want to get into any specifics, so “they” it is. Don’t fret or worry. Instead of worrying, pray. Through petitions and praises, turn worry into prayer, letting God know your concerns. Before you know it, a sense of God’s wholeness, everything working together for good, will come in and settle you down. It’s wonderful what happens when Christ displaces worry at the center of your life. Over the last few weeks I’ve been memorizing these verses, so if some of the words are slightly off, that’s why. There’s some more that I haven’t yet memorized, but the part I have memorized has been valuable to keep meditating on, given the last couple weeks. Monday and Tuesday were normal. Then, on Wednesday, Mom would pick Benji up from school early and the two of them would fly to California for a five-day trip visiting my Nana and sister and brother-in-law. I can’t even describe how eagerly Ian and I anticipated this reprieve. Whole days of caring only for ourselves! Time to spend together! Time to spend alone! I also looked forward to getting to work at 6:20 those extra days to get a lot accomplished towards the upcoming release, which is next Thursday, the 22nd. Because of some factors outside my control, I’ve had less time than usual at work to get my release documentation written, and I really looked forward to the extra time… and to not worrying about what time I left work. Normally I’m constantly torn between trying to eke as much time at home with Benji as I can, and, on the other hand, equally eking out as much time at work as I can so I can get my tasks done. The same is true every time I go out for a ride: balancing the time at home with Benji vs. riding time. I really eagerly anticipated having this pressure taken away for even just a few days. Then on Monday Benji came down with a high fever–101 under his armpit. I ended up meeting Ian and Benji at the ER, but we didn’t end up staying to be seen. Instead, we headed home to just wait and see what happened. What happened was, so far, two more days of relentless fever and lethargy. All Benji wants to do is lay on the couch; if the ibuprofen is working, he’ll watch a video; if it’s wearing off, he just wants to lay quietly and be left alone. Just having someone nearby is enough. It walks like the flu, it quacks like the flu; I think it’s the flu. I didn’t get him a flu shot this year because I was at work and I kept forgetting. Now I’m kind of regretting that, even though I know the flu shot is only minimally effective this year. Regardless, now we’re in the middle of it, and we have to ride this bronco until it throws us. Benji is miserable, and I feel very sorry for him. I know that feeling very well, and I’m so sorry he has to go through it. He’s hanging in there, though, and subsisting primarily on the “awesome sauce” apple sauce he got for Valentine’s Day from one of the teachers (delivered to us by the generous Nana delivery service). But what this means is that instead of getting extra time on our own, we’ve instead taken away from even the usual amount of time. Instead of bonus time, we’ve…what’s the opposite of bonus? We’ve got minus time, I guess. Because so far Ian’s taken one day off work to stay with Benji, and I’ve taken one day off work to stay with Benji, and now Ian’s taking a second day off today… and what do you think are the odds that I’ll be taking Friday off? Remember that release I have looming in a week? And all that writing I need to do to be ready for it? Take away two work days from my prep time, and I’m really starting to feel the pressure. Plus, what do you think the odds are that Ian and I will both be able to remain healthy and flu-free after caring for Benji this week? And when would we start getting sick? That’s right: middle of next week, right about the time of my release. If Ian gets sick, I’ll have to pick up the slack, and that means I can’t be at work on release night until 7:00 or 8:00 pm. If I get sick, I know from having the flu before that I’ll be wiped out for a solid seven to 10 days, with a much longer time to full recovery. There goes not only my release, but also all the hard work I’ve put in biking for the last year as I recovered from pneumonia last December. It’s pretty hard to displace worry with Christ at the center of my life right now, I’m not gonna lie. I feel like there should be achievement badges for adult activities like parenting. For example, a couple weeks ago, Benji came crying to me and said he’d bonked himself; I looked and gave him a hug, but told him, “If it’s not bleeding, you’re probably OK.” It felt like a milestone in parenting. 5:30 am – Wake up and go downstairs to start making oatmeal. 5:45 am – Benji wakes up and is starving. Give him some almonds and water to hold him for a while. 6:00 am – Benji officially “gets up” and wants to play. 6:00 am – 8:00 am – Help Benji make his own oatmeal; troubleshoot issues with oatmeal (not enough banana slices, need more oats, need more water); try to eat own breakfast before it gets cold; read Benji story while he eats; Ian takes over playing with Benji while I brush teeth and put on clothes; play games until school time. 8:35 am – Pack up nap bag; get Benji and self ready for going out in the 18-degree temps. Leave for school. 9:00 am – Drop off at school. Teacher reminds me that I volunteered to make play-dough for January. 9:05 am – Stop at potential daycare for discussion. Write check for first month. Feel conflicted. Get phone call from friend about date to go for a walk. 9:15 am – Put gas in car. 9:20 am – 9:45 am – Drive to friend’s house. 1:30 pm – 2:15 pm – Drive to parents’ house. Pick up swimming suit for lessons starting this weekend. 2:15 pm – 2:45 pm – Walk with mom to grocery store. Purchase groceries (long line), walk back to car, drive home. 3:00 pm – Get home. Make play-dough for school. 4:00 pm – In-laws bring Benji home. He’s a in a good mood but tired from not napping. 4:00 pm – 4:15 pm – Try to plan logistics with in-laws but constant interruptions make it difficult. 4:15 pm – 5:45 pm – Play with Benji. Ian coming home late. 5:45 pm – Feed Benji dinner. 6:00 pm – Ian gets home tired. 6:00 pm – 6:30 pm – Play more. 6:30 pm – 7:30 pm – Ian puts Benji down for bed. 7:30 pm – Eat leftovers with Ian and discuss daycare. 9:00 pm – Go to bed. Sleep badly due to anxieties about daycare and new job situation. Cleaned out the garage. Filled recycle bin and garbage can. Swept garage and tidied up remaining stuff. Figured out what will be given away. Sorted through humongous pile of rags and retained only the ones good for bike cleaning. The extras filled up an enormous paper yard waste bag. Sorted through all old bike parts and collected everything to be recycled. Tidied everything else. Drove to recycle place and dropped of huge load of recyclable clothes and old bike parts, including a big pile of tires and tubes. Cleaned out my bike area of the laundry room and broke down a bunch of cardboard boxes. Filled recycle bin with flattened boxes. Researched Light & Motion light replacement (8 years old; amazingly, the battery still works, but is fading fast) and obtained existing-customer 30% off coupon (yeah!). Continued to research childcare options. Filled out next year’s kindergarten registration form. Read daycare packet and began completing forms (there are a lot). Did trainer ride with intervals during nap time, making it a whole 20 “miles” and finishing 5 minutes before Benji woke up. Printed out planet pictures for Benji. Drew extra planets that were missing (all the dwarf planets, plus the Asteroid Belt, Kuiper Belt, Oort Cloud, and the Sun). Helped him cut them out. Played “planet game” twice before going totally crazy. My days this last week reminded me how much work it can be just to be a full-time mommy. Every day this week has involved more activities and running around even than when I was working from home; after all, back then I had a responsibility to complete my work, so all my free time went to that. Now I have some time to get all those neglected around-the-home chores tidied up before I start the new job, and it’s reminding me how much unnoticed work mommies do to just keep life running smoothly. Kudos to all mommies out there! 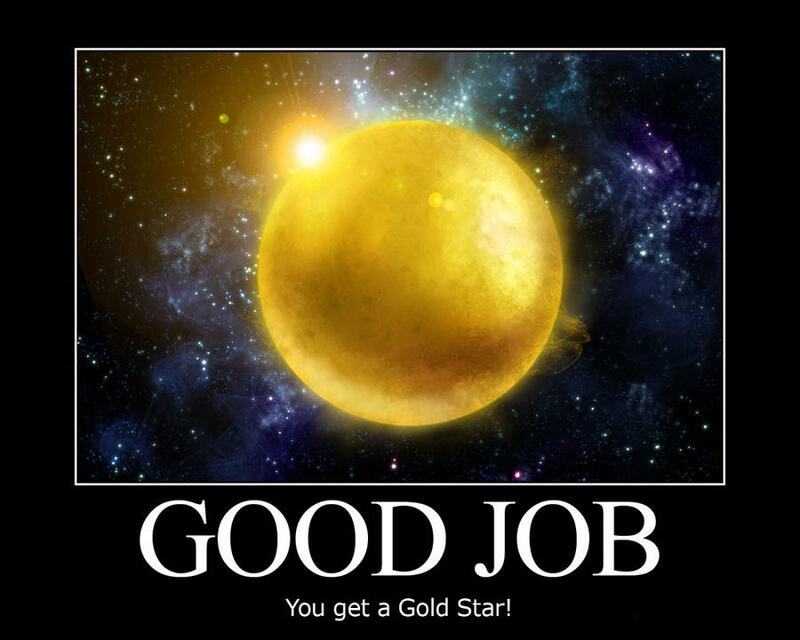 You deserve a gold star! Now I’m off to join the ranks of the fully-employed, and only time will tell about when all those mommy jobs get done, and by whom! At the New Year, people usually reflect on the past year. I’ll follow that well-trodden road with an emphasis on my employment situation, because this year and next year are shaping up to look so different as to be unrecognizable to one another. This year saw me reach a tipping point with my Client Service Administrator (CSA) job at Kaizen Financial Advisors, a job I haven’t mentioned much due to compliance and confidentiality concerns. Remember that spectacular sunrise picture I’ve posted more than once? 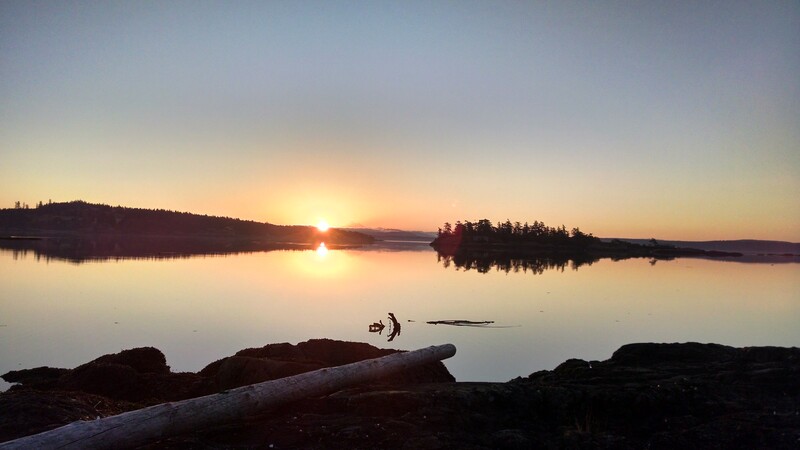 That morning, sitting quietly on the beach while a deer meandered by, I felt a strong sense that it was time to move on from serving as a CSA. Although I could complete the job tasks well enough, and I served my boss and our clients to the best of my ability, I never got excited about my work. I had the job not because I wanted to work in finance, but because four years ago, my boss offered a super-convenient work-from-home job that I thought would help me stay sane through all the diapers. And it has, so my thanks remain to the job for that. Yet, this photo reminds me of that contemplative hour that, in some ways, led me eventually to my choices today. It’s when I started questioning our status quo, a tipping point. Even though that’s when I started questioning whether I should stay at my job, I didn’t immediately give notice back then; I was too afraid of making big changes, and I felt loyal to the company and my boss. But in the intervening months, some personal things combined with a growing realization that I needed a change in my employment situation. I didn’t have any ideas what that might look like at the time, but by Thanksgiving, I knew something would have to change. At the same time, back in September I went with Kaizen to a user group at Tamarac, a company whose software we’ve used for many years. Their software has dramatically improved in usability over the last couple years (and I’ve done more training, which helps), and using that software was a big part of my CSA job. During that user group, I arranged for us to get a tour of the company and meet our support team, some of whom we’ve worked with for years. At that time, I found myself thinking how cool it would be to work in that environment. Their company culture seemed positive, and the people we met all seemed nice. I liked their vibe. I idly browsed their job listings, but didn’t see anything compelling — certainly nothing worth quitting my super-convenient work-from-home job in favor of a commute to the Columbia Center in downtown Seattle. But after that I occasionally would eyeball their local job listings to see if anything really compelling came up. Meanwhile, I gave my notice at Kaizen, and had my last day yesterday, Friday, December 30. Earlier this week, I handed over all my home office supplies and my laptop, along with a big document describing how to do most of my tasks. It felt a little bit like graduating from college again — there’s no “homework” hanging over my head after four years! Hooray! Last month, something really compelling at Tamarac did come up: a Technical Writer II position, the perfect blend of my previous writing experience and current financial experience. After some serious soul-searching and late-night conversations with Ian, we decided I should apply and see what happens. What happened was that I got an interview last Friday, which (despite my still recovering from pneumonia) went swimmingly. I thought so, and apparently the hiring manager thought so, too, because he called last night with a job offer that had me bouncing with enthusiasm. I agreed without negotiation or hesitation. It will be at least two weeks before I can start, which is good, because that gives us some time to look into childcare options. As those of you who know me well are aware, this is way, way, way outside my standard operating procedure. In our family, we act cautiously, with comprehensive planning ahead to cover every contingency, never making seriously big decisions quickly or without knowing as much as we can about how it would work out. But with this job, we don’t know what will happen for childcare and we don’t know about how my commute and being gone full-time would impact our daily life; but I do know this is a job I’m really, really excited about, for possibly the first time in my entire working career. That, I will fight for. One, two free, here we go! “What I’m trying to do here is get you to relax, to not be so preoccupied with getting, so you can respond to God’s giving. People who don’t know God and the way he works fuss over these things, but you know both God and how he works. Steep your life in God-reality, God-initiative, God-provisions. Don’t worry about missing out. You’ll find your everyday human concerns are met. “Breaking up is hard to do,” or so I’ve heard. I haven’t talked much about my job on this blog, because things said on the internet stay on the internet forever. I don’t intend to change that policy now, so this won’t be a long ranting post about all the reasons I’m leaving (it may be long, but not a rant, anyway). Suffice it to say that I’ve spent some substantial time considering my career path and existing opportunities, and after four years with my current job, it’s time to move on. As many of you know, I never intended to get into the finance industry. I got a BS in Technical Writing, and my first job was writing lab reports at a preclinical testing facility. Some people object to the animal testing aspect, but I found the job to be quite up my alley. I probably would have continued doing that job quite happily for many more years, but alas, the company got into financial difficulties and laid pretty much all the technical writing staff off as expendable (“we can have the scientists do it in all their free time!” Uh, sure). That worked out fine for me because we were ready to move back from Massachusetts anyway. Funny… that was six years ago this month. Finance was never my passion. I’d not planned on rejoining the workforce for many years, expecting to remain exclusively a stay-at-home mom (won’t get into what a misnomer that phrase is!). 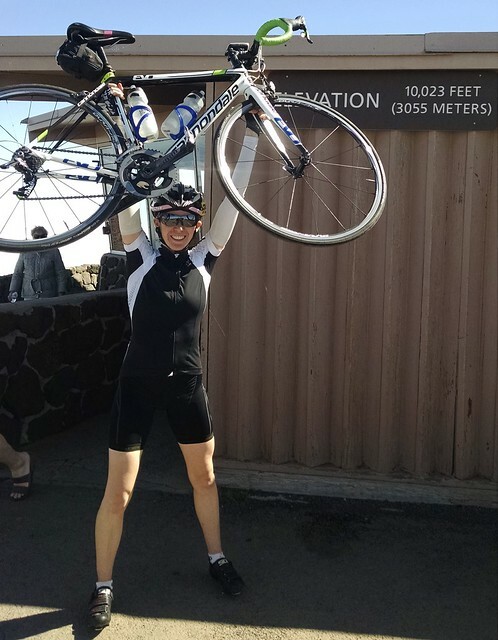 When my boss offered me a super-flexible 10-hour-a-week job shortly after Benji’s birth, I thought, “Why not give it a try?” I had spent many hours biking with my boss before she hired me, and we certainly think alike in many ways. She knew I was a complete finance neophyte, and she was willing to take me on with the expectation of training me on the job. All things considered, it’s gone amazingly well for the last four years. At first I worked maybe 10 hours a week, sometimes less, learning the business and my firm’s processes. Over time I’ve slowly taken on additional responsibility, until now I work closer to 80 to 100 hours a month, having absorbed tasks from a coworker who retired as well as taking on more of my own duties. I think I’ve gotten decently good at my job duties. However, as my level of responsibility has grown, it’s become increasingly clear that my boss needs someone 40 hours a week to provide the support she needs. We’ve had frequent conversations about my boss’s concerns, but despite implementing several procedural changes to address the issue, frustration has remained. I remain constrained by the fact that I serve as Mommy first and Client Service Administrator second, and when wearing my Mommy hat, I stringently avoid working unless it’s an emergency. WHAT THE HECK is a upholstery emergency? I mention this because I know that sometimes emergencies are in the eye of the beholder. In the long run, however, I’ve come to realize that despite four years and two licenses in the finance industry, my passion remains with technical writing. I actually liked my first job, and I enjoyed best aspects of my finance job where I got to create documents or write or edit copy. That’s probably a good indicator that I need to look in that direction again. To that end, I’m also applying for a technical writing job at a company called Tamarac. They write financial software, and I’ve worked with a fair bit at my finance job. This is a full-time job in downtown Seattle, so it’s a huge leap of faith to even apply. Ian and I don’t know what we’d do with Benji if I started a full-time job with that long of a commute. But I’m feeling really strongly that I’m meant to pursue this opportunity — much more strongly than I’ve felt about employment in years. So we’re going to take the leap and trust that God will provide if it’s meant to happen. Time to go out on a limb. If nothing else, life will look very different in six months. If I could climb Mt. Haleakala, I can do this. It’s just been a busy few days. Last week it seemed like the days filled up so fast, I couldn’t catch up. There was work, bike training, and Benji — my life feels full. I’m enjoying the bits I’m learning about the finance stuff for my job. It’s very reminiscent of my time with Charles River, in that both industries are heavily federally regulated and involve lots of paperwork. Apparently that appeals to me, because as I’ve started to do a bit of work for Laurie, it’s felt like coming back to a career I’m suited for. I’m interested and excited to learn more. The big exciting thing for me was that on Saturday the 23rd I did my first-ever bike race, although it was really dipping my toes into racing. What I did was the Frostbite Time Trial, a 12.5-mile, perfectly flat course between Carnation and Fall City. The idea of a time trial is that you ride all by yourself as hard as you can go, racing the clock. There’s nobody around you and if you crash, it’s because of your own stupidity. I didn’t crash or do anything stupid, and I both started and finished. This was my icebreaker into racing, and I feel ever so much better having done it. Now I’m ready to do a race that plays to my strengths — wheelsucking, hills, and longer distances. For the record, I placed 14th out of 35 Cat 4 women with a time of 36:25, for an average of 20.5 mph. Apparently I should be pleased; that’s good… “for a climber.” Hah. I’ll do better next race. But now I know I can ride that hard for that long, which I didn’t know before. Good data. Meanwhile, Benji seems to be on a bit of a 6-month crazy baby kick. He normally has a very predictable sleep schedule, eats well, plays happily, and is generally my favorite baby ever. The last week, though, he’s waking up a couple times a night; spends the day grumbling; refuses to nap; refuses the bottle; and generally acts grumpy. But he’s also started deliberately trying to make sounds: “ma” and “ba.” He gets this look of intense concentration on his face and you can see his lips moving into the shape. Sometimes a noise comes out, sometimes not. It’s fun. He has also figured out how to use the Johnny Jump-Up, and now jumps like crazy in there. This may also be what has helped him figure out that he can use his legs, because when we hold him, he’s starting to straighten his legs and put weight on them a bit. Even so, he’s still not rolled over back to front, and he doesn’t really move around when we put him down — for which I’m profoundly grateful. I know those days are numbered. More details soon. I’m off to yet another team activity. Like I said, busy life these days. Boy does time go fast! I can’t believe it’s been a week – and a busy week at that. In addition to taking care of my yeast infection issues*, I started my new job as Client Service Administrator (aka “apprentice financial planner”) with Kaizen Financial Advisors. Fortunately, right now that means I closet myself in my home office for a few hours a few days a week and make arrangements for childcare to facilitate the occasional mandatory in-person client meetings. I anticipate learning a lot. 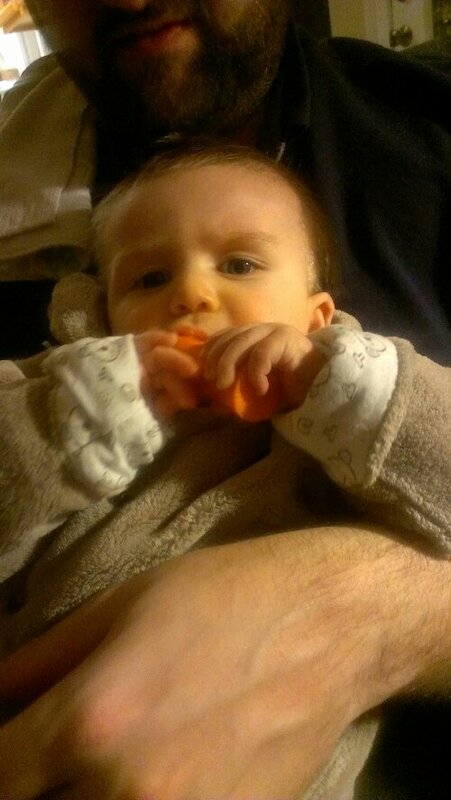 We also gave Benji his first taste of solid food: mushed-up avocado. He was less than thrilled. The first time, this last Sunday, I don’t think he actually swallowed any of it, but did manage to get it all over his face and hands. The second time, today, Deborah fed him while I held him and he actually seemed to swallow some. At least, avocado disappeared off the spoon and didn’t reappear on the bib or his face. Yeah, not super enthusiastic, but we’ll get there. 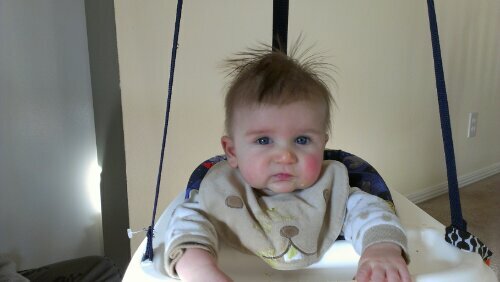 If nothing else, I am excited to start him on solids, and I can’t believe he’s old enough for that already. In other non-Benji news, I can’t resist mentioning I got a new fork (a Whiskey No. 5) for my pink bike, Artemis. It so dramatically improves the ride experience, it’s almost like getting a whole new bike. I’m exorbitantly pleased and can’t help raving about it. I’ll try to keep the thrilled comments to a minimum, though. Finally, a friend of mine joined us and some folks from our church who helped us obtain and move in an armoire that, as advertised, required 4 strong guys to shift. It definitely did not get upstairs, as I initially hoped, but we found a good home for it downstairs. I’m quite pleased. A huge thanks to Karissa, Ian, Matt, Mike, and Isaac, who made it possible. * This has been the final straw. After much painful deliberation, I have decided to quit pumping – and therefore stop providing breast milk – when Benji hits 6 months. Whole nother blog post there.